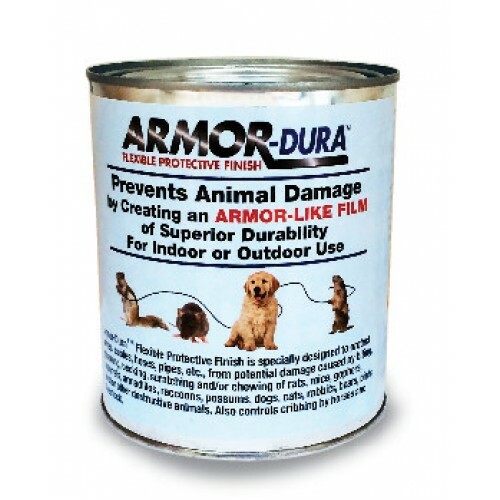 Armor-Dura's flexible protective finish was designed to protect wires, cables, hoses, pipes and more from damage caused by animals chewing, gnawing, biting or scratching the surface. When properly applied, Armor-Dura creates a light-weight, non-conductive, flexible, super hard film, or barrier, that stops animals from eating through or penetrating the surface, without injury to the animal. 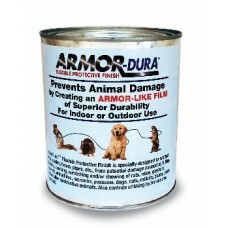 You can rely on Armor-Dura to stop pets, pests and other animals from accidentally electrocuting themselves, from biting into and damaging computer, television fiberoptic and utility cables and wiring, and from chewing into attics, and eaves. It will stop bears and other destructive critters from ruining sheds, mailboxes, bird feeders, siding and garbage bins, and it will stop horses, cattle and other livestock from cribbing on fences, stalls, gates and barns, among other things. Armor-Dura is versatile. It an be used outdoors or indoors. It is long-lasting, consists of environmentally friendly active ingredients, and is harmless to animals. It is non-conductive, corrosion, UV, and oxidation resistant. Armor-Dura can even be used over soft metals and alloys. Armor-Dura contains the world's 2nd and 3rd hardest known substances, in conjuction with specialty chemicals. These ingredients are almost diamond-like in hardness, thus forming an amazingly sturdy barrier to damage. Armor-Dura also affords exceptional protection from sunlight, rain, wind, moisture and temperature changes. Contents: 8 oz. and 32 oz.